In the circumstances reported by the Chief Executive Officer, Dr NTRVS Trust, AP in the reference 3rd read above, Government after careful examination of the matter hereby accord permission to carry out One Time Master Health Check of the Employees and their spouses, Pensioners and their spouses. The expenditure for primary investigations will be shared equally between the Government and employees/pensioners. The Master Health check-up will also be considered as the 1st Annual Health Check-up. Further, the Annual Health Checkup shall be carried out for the employees above 40 years of age from the subsequent year as a regular feature every year. 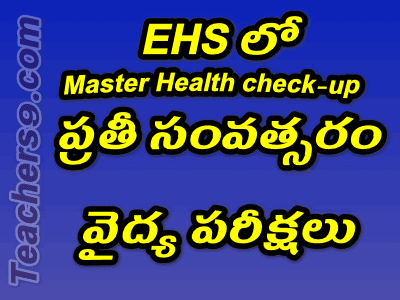 The 2nd Annual Health Check-up shall be after 12 months of the Master Health Check-up. One Time Master Health Checkup/ Annual Health Checkup shall be carried out at the Network Hospitals of Dr NTRVS Trust having in-house laboratory services for conducting Primary Investigations. The Secondary investigations shall be considered in accordance with the recommendation of the specialist consultant of the Network hospital and can be undertaken in any empanelled Network Hospital. The expenditure incurred for Secondary investigations shall be borne from EHS budget. The cost of Primary & Secondary investigations will be as per CGHS rates currently applicable in Andhra Pradesh. The list of Investigations forming Primary & the Secondary investigation is annexed to G.O. The Hospitals conducting the Primary & Secondary investigations are required to furnish the results of investigations to employees and a digital copy of the investigation values to Dr NTR Vaidya Seva Trust so that Digital locker based secured health records of the employees be created. The Chief Executive Officer, Dr NTRVS Trust, AP Guntur shall take necessary action accordingly. This order is issued with the concurrence of Finance (FMU.HM& FW-I) Department vides their U.O.No. 42029/1/FMU.HM&FW/2018, date: 04/09/2018.